I know people have tried much longer [than we have], but if there’s anyone out there who is trying and they’re just losing hope, just hang in there. Try every avenue; try anything you can do, ’cause you’ll get there. You’ll end up with a family, and it’s so worth it. It is the most ‘worth it’ thing." A few months back I introduced you to a very inspirational woman, Tonya. I was inspired by Tonya' strength and refusal to give up and back down from Secondary Infertility. Her words encouraged me, educated me and gave me new hope. When we see family and friends announce pregnancy, there is always a butterfly you feel in your heart. Knowing the overwhelming love they are about to experience can be breath taking. But when a sister with S.I. announces her pregnancy it is like a volcanic explosion. Your heart bursts, knowing that fight is over and now it is only LOVE LOVE LOVE!!! Congratulations Tonya, I can't put into words how happy I am for you! 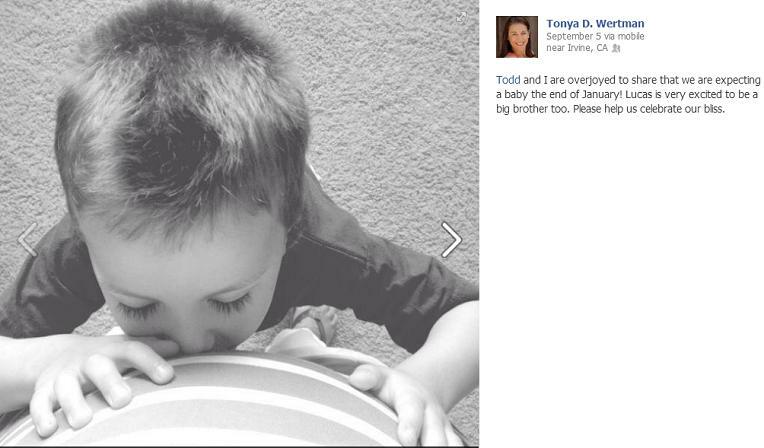 Here is Tonya's announcement. I know your heart will explode. Thank you for this, you are too sweet! I feel so very blessed that there are no words and part of me is still in quite a bit of shock. I'm anxious all the time, but so happy. Your blog is lovely as is your family.